Achieve Mythological Muscle Growth & Strength! 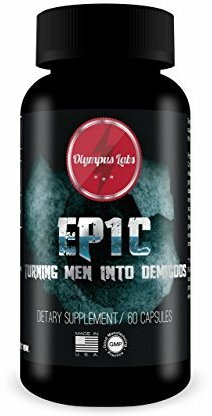 Experience the power of (-)-Epicatechin with Olympus Labs Ep1c! (-)-Epicatechin is revolutionizing the bodybuilding supplement industry by providing a natural alternative to prohormones and test boosters. Although it's hard to believe, this flavanol, found in cacao beans, supports unprecedented muscle growth and strength gains naturally. The secret to (-)-epicatechin's success is follistatin. To understand the value of Ep1c, you need to understand the roles that follistatin and myostatin play in your muscle development. Myostatin is a protein that is principally manufactured in skeletal muscle cells. It inhibits myogenesis, the process of creating muscle tissue, in order to impede muscle growth. As we get older, our myostatin levels increase, which can lead to losses in muscle mass and strength. So how can we combat myostatin and experience increased muscle growth? Ep1c contains (-)-epicatechin to promote follistatin, which counteracts the obstacles to muscle gain posed by myostatin. Follistatin is a protein that restrains the activity of myostatin by adhering to it and obstructing receptor binding. As a result, follistatin aids muscle growth as well as strength. Unlike myostatin, follistatin declines as we get older. In an animal study, aging caused an increase of 18% in myostatin while follistatin dropped by 30%. Ep1c helps to suppress myostatin, making it extremely beneficial if you're looking to fight the deleterious effects of aging. It combats the increasing myostatin levels with (-)-epicatechin, which also has been shown to support follistatin. An animal study found that administering (-)-epicatechin resulted in a 56% increase of follistatin in old mice. The researchers also discovered a 15% decrease of myostatin levels in both young and old mice. Amazingly enough, the old mice that were treated showed myostatin levels similar to the levels of untreated young mice. With Ep1c, you can combat the aging process! With (-)-epicatechin, Ep1c supports increased follistatin levels to help you achieve gains in strength and muscle growth. In a human study, (-)-epicatechin supplementation for 7 days resulted in a 7% bilateral increase of hand grip strength. According to an animal study, it also may elevate Myogenic factor 5, or MYF5, protein levels. This is an important indicator of muscle growth as MYF5 is a protein that performs an essential role in supervising myogenesis. Ep1c also helps you to achieve your training goals by promoting endurance, angiogenesis, and nitric oxide production. Researchers observed that administering (-)-epicatechin to mice resulted in an increase of approximately 50% in exercise capacity. Remarkably, the mice maintained an increased level of exercise capacity even 14 days after the end of treatment. Ep1c supports enhanced endurance you can maintain! Ep1c supports angiogenesis, the process of creating new blood vessels from pre-existing vessels. While it's usually affiliated with aerobic and endurance exercise, research suggests that (-)-epicatechin promotes angiogenesis as well as the oxidative capacity of skeletal muscle. Angiogenesis helps boost the number of capillaries in order to promote increased nutrient delivery over an extended period of time. Therefore, it enables skeletal muscles to receive more of the nutrients they need during exercise in the most efficient manner. By increasing the number of capillaries, it also supports enhanced oxygen exchange. With Ep1c, you can achieve extreme pumps during your workout! It accomplishes this by supporting endothelial nitric oxide synthase (aka eNOS). An enzyme that is a nitric oxide synthase, eNOS is responsible for manufacturing nitric oxide in blood vessels. As a result, it enhances your pump while you train. eNOS also plays a role in regulating vascular tone to further enhance blood flow. According to human research, (-)-epicatechin can elevate endothelial cells' nitric oxide levels, thereby enhancing vasodilation. A study published in the International Union of Biochemistry and Molecular Biology found that after a period of 6 days, nitric oxide synthase activity increased drastically by 173% in the spontaneous hypertensive rats (SHRs) given (-)-epicatechin compared to the non-supplemented SHRs. Ep1c helps you to experience amazing pumps while you work out. Olympus Labs gives you the real deal with no fillers. A bottle of Ep1c will yield 18g of (-)-epicatechin, giving you the most bang for your buck. (-)-Epicatechin helps suppress myostatin and enhance follistatin. It aids muscle growth and strength as well as superior performance. Turn back the clock with Olympus Labs Ep1c! These statements have not been evaluated by the FDA. These products are not intended to treat, prevent, or cure any disease.